Planning your next adventure? Consider these suggestions and best practices before you leave home, and let me know if you have other ideas I should add to this list. Negotiate all itineraries, fees and prices upfront. Demand no add-on’s while touring (you should have control over every place your guide will take you and your time-line; this includes planned restaurant stops). Always have a copy of every confirmation number, hotel address and phone number. You will need it at some point. Paper beats digital in most places, especially India. Insist that your tour company provide a bio and photo of your driver and every guide before you arrive. You will have a much better experience if you use mature, experienced local guides. Veteran guides are more likely to have a good relationship with the Army or Police guarding historical sites and may be able to get you access to areas and features that are off-limits to the general public or help you navigate through heavy crowds quickly via staff entrances or other secured areas. Always carry 2X more local currency than you think you will need. Always make change from big bills into useable denominations at your hotel – never change large bills at street vendors or other locations. Insist that your driver keep doors locked, and leaves separation from the cars ahead of you in traffic and at stops. Sit behind and opposite your driver. You must be able to make eye-contact with him while riding together. And always wear a seatbelt. Keep medicine (aspirin, visine, chapstick)/glasses/socks/earplugs/sunscreen/insect repellent/sunglasses/iphone charger/spare headphones/extra pens in your personal bag. Never take physical keys from a hotel off property – leave them with the hotel staff when you leave. Consider leaving a note for yourself that includes where you’re going, who you will meet and when you plan to return. Assume insects are harmful – don’t let them bite you. Use insecticide and wear long-sleeved shirts and long pants. Always ask hotel/restaurant staff to provide mosquito coils if you’re dining outside. Do not use deodorant and if you must, use a fragrant-free version. This will reduce your attractiveness to many insects. Do not drink anything that was not opened in front of you or boiled. Wipe or rinse bottle tops before opening. Arrange your room to make a clear path to your door in case of darkness/power loss. Stay hydrated/rested and avoid heavy alcohol consumption. Do not wear jewelry, fancy watches, etc. Never have both hands full. Women should not travel alone. Women should never use public transportation. Always keep two extra water bottles with you for emergencies – buy more when you get down to the last two. If you’re approached by a stranger, expect them to have a partner. It’s not usually the person who approaches you first who is your greatest threat. Do not spread out your belongings in your hotel or vehicle. Keep your belongings organized and packed as much as possible in case you need to make a fast exit. Additionally – when you keep your room neat and organized, you’re making it easier on the hotel staff to make up your room. They’ll reciprocate – it’s especially helpful when you forget an item and leave it in your room – they’re much more likely to “find” it. Don’t fall in love with anything you own – be prepared to leave it behind. Keep immodium accessible (you’ll know when you need it, and when you do speed will make a difference). Share the same safe combination with your group – someone else may need you to collect your valuables for you. Carry several “chip clips” in your luggage to keep stubborn drapes closed in your hotel room, or to hang wet laundry. Never keep all your cash, ID’s, and Credit Cards in the same pocket. Use multiple pockets and spread things around. Never store your full data cards with your camera, put them somewhere else (but never in checked luggage). Pack using 1 gallon Ziploc bags. They’re great for all kinds of things, and water-proof. Carry a number 2 kit: Toilet paper (1 roll); wet wipes (1 pack); baby powder (1 10oz container) – keep it in a single 1 gallon Ziploc bag. Stow your overhead luggage across the aisle from your seat, where you can see it. Never set anything down at airports, taxi stands, train stations that isn’t between your legs. There is no greater expression of freedom than to cross borders and visit countries, cities and places for the first time. It’s more productive to learn about property rights, court systems, infrastructure, tax authorities and other systems that define modern life around the world as you pass through it. How does a country pay for school, medical care and retirement? I have always approached travel with a sense of adventure and wonderment and these are fun topics to bring up with locals and other travelers during my trips. As an Army Platoon Leader security and sanitation were pounded into my head. You could not achieve one without the other and they are both critical to a high quality, sustainable existence. That experience taught me that developed countries must have frequent, consistent garbage removal, clean water, and steady electricity. Without any one of those three, other systems fail and the community cannot compete globally. During trips to Europe, South America and Asia I would ask people about the most unusual places they’ve visited? The most out-of-the-ordinary, different experience? 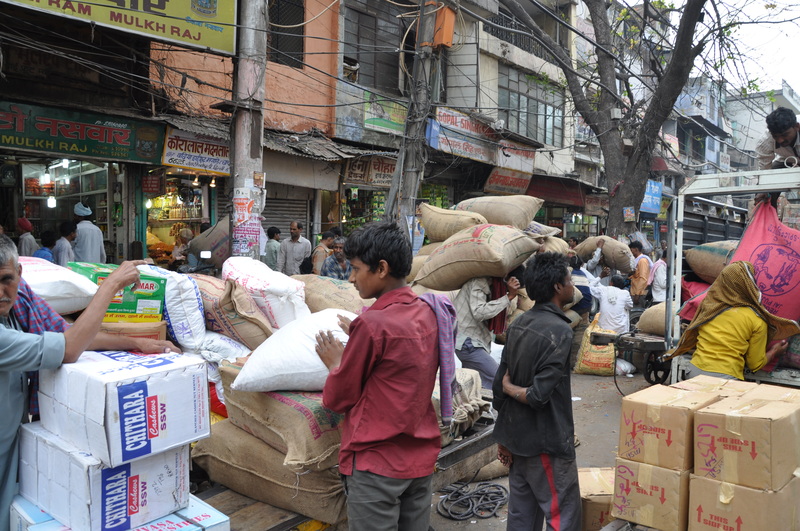 I kept hearing – “Oh – if you’re looking for different, go to India.” So I did. And it exceeded my expectations in every way. I lived in South Korea eight years after the 1988 Olympics. Infrastructure was defined as “pre” or post-Olympics. The entire country was dominated by three things: craggy mountains, concrete high-rises, and rice patties. South Korea advanced rapidly leading up to the Olympics and into the present day. It is a modern country (even with occasional ox-carts, honey-dippers, and other features from Korea’s past). Not so with India. India isn’t a country so much a collection of States – each with their own identity, languages, customs, traditions, and governments. British Colonial rule established the framework for present-day India, but the British couldn’t conceal India’s identity. Indians suggest that you spend months in India to experience the real place; as an experienced traveler I concede that it would take weeks to experience the whole place, but few visitors have that much time. 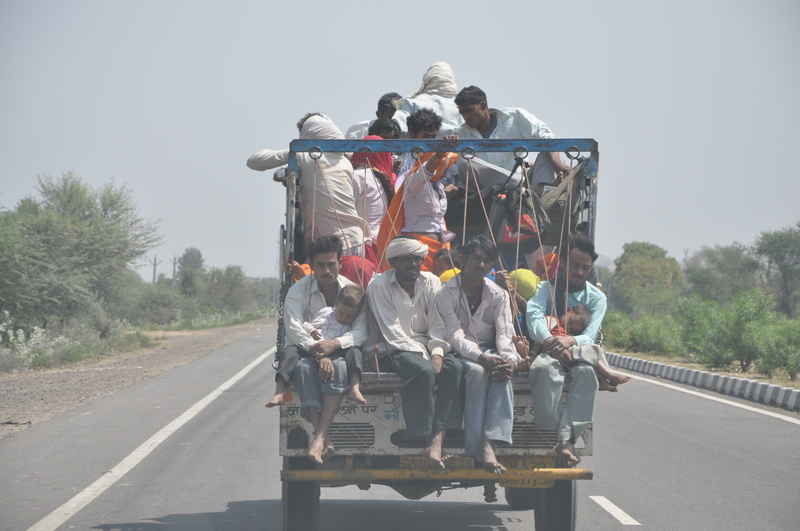 My trip was an exploration into the Western desert in the North, to Rajasthan. Rajasthan is the place Steven Spielberg must have used as inspiration for Indiana Jones; you’ll feel like you stepped into a movie as soon as you leave the airport in New Delhi. The ride to my hotel was incredible – what do you get when you cross a traffic jam with a zoo? Camels, elephants, cows, monkeys, rickshaws, and a huge assortment of cars, trucks, tractors and buses merged together without any thought about lane markings or traffic rules. 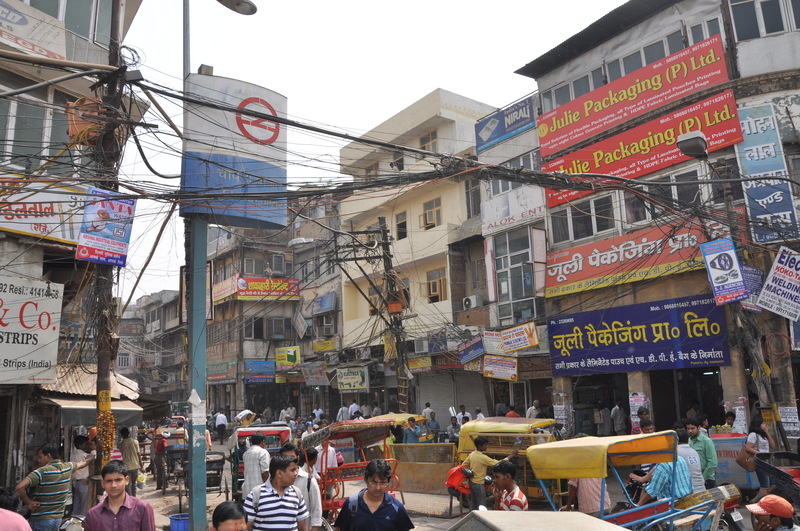 Delhi is complicated – I was amazed by the care and expense that went into building monuments and government offices, but disappointed by how neglected they were. 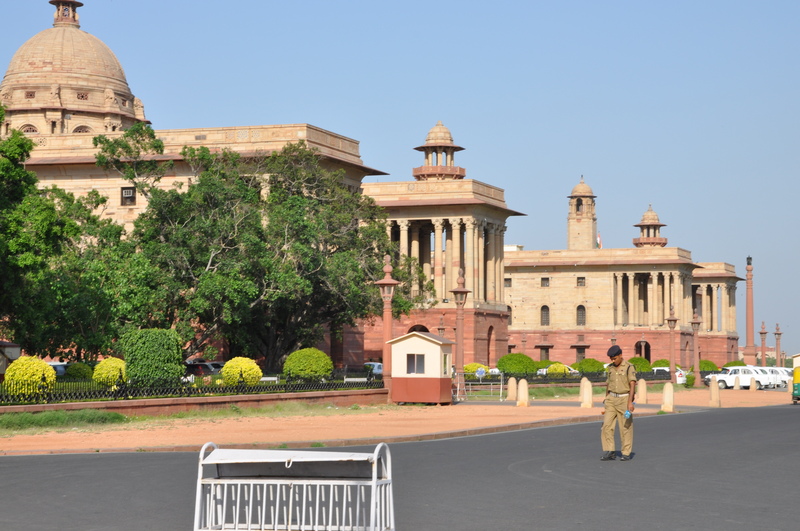 On my first day I walked past countless embassies and around the government buildings until I reached India Gate. It was a long walk, but I enjoyed taking in details that I would have missed from a car. Everyone I met seemed friendly. I stopped to watch kids playing cricket and even spotted a young girl riding a ten-speed bike that was way too big for her. She rode with her legs straddled between the lower frame bar and held the top bar against her side while she peddled. That was the only picture I regret not taking. 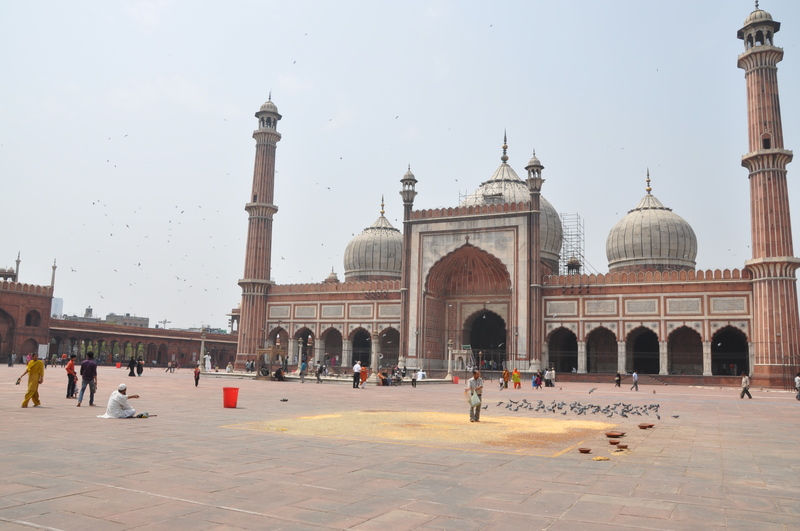 My tired feet forced me to ride the subway from Connaught Circle to Jama Masjid where I was hijacked by more than one unscrupulous rickshaw driver. The cabs weren’t much better, but it beat walking. It’s worth warning that if you’re on foot, watch out for people on scooters and motorcycles who make it a sport to hit you with their handlebars or mirrors – you must be alert; I enjoyed playing along like a clueless pedestrian and would step out of the way a second before they passed me. 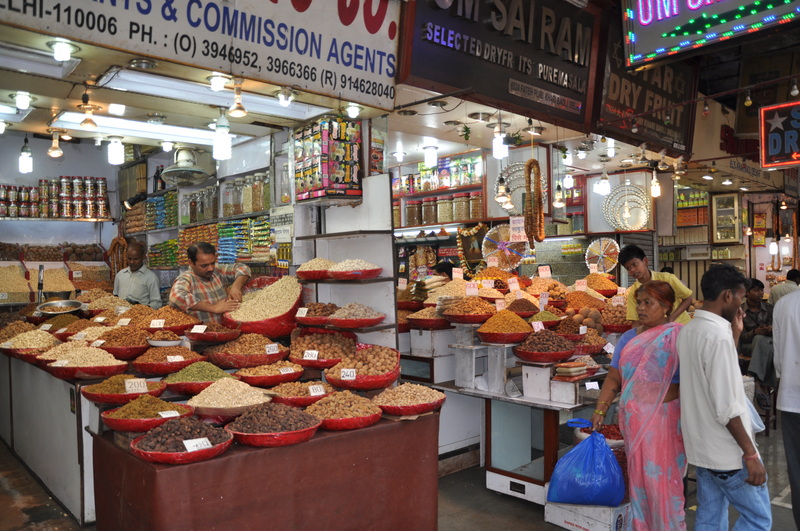 In Delhi I recommend visiting the Red Fort and Jama Masjid along with the Delhi spice market. They are very close together and easy to see in two or three hours. 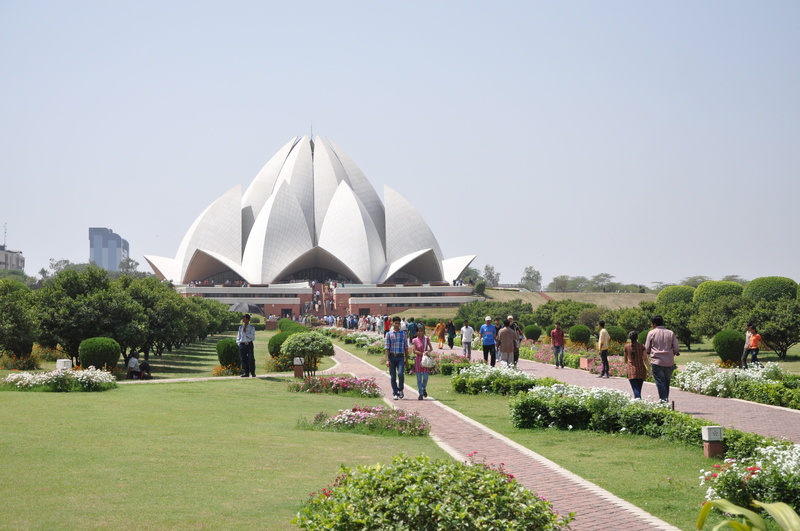 In the afternoon I enjoyed seeing the home were Ghandi spent his last days, and Muyaman’s Tomb and the Lotus Temple. There are few places where you can visit multiple World Heritage Sites in one day, but India is full of them. 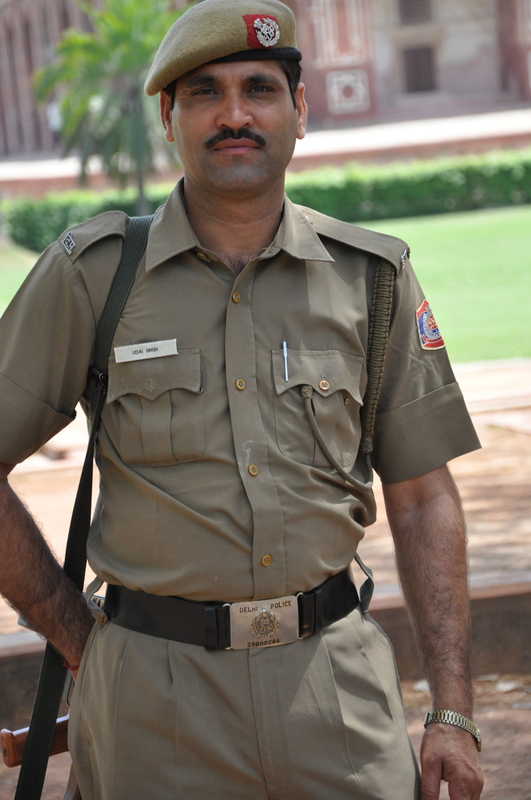 After spending the first two days exploring Delhi – New and Old before I was ready to go West with my driver, Mahendra. 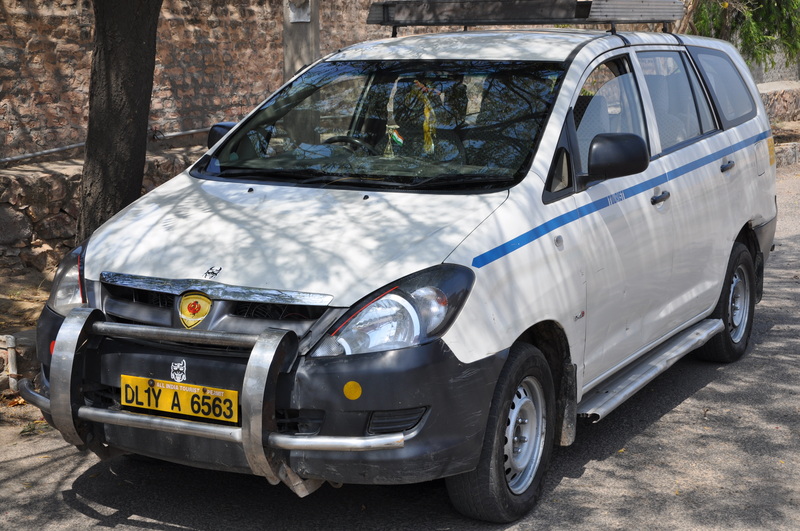 He was equipped with a ubiquitous white Toyota crossover (half station wagon, half mini-suv) with blue pin-stripes that marked it as a tourist car – the paint job acted like a glow-in-the-dark target that attracted offers for every imaginable product. Guests are expected to ride in the back, but I moved to the front seat to improve my view and quickly learned how to snap pictures on the go – there’s so much craziness to see! I was amused to learn that every State requires drivers to pay a road tax once every month in person when they cross into the territory. Since my visit straddled two months I enjoyed people-watching from the highway tax office parking lots at every border. India gives the Griswold’s a run for their money. Back on the road the next adventure would always appear in the distance. This one caught Mahendra’s attention and he quipped, “so dangerous”. I agreed, but you’ll soon discover that people adapt to their situation and surroundings very well. 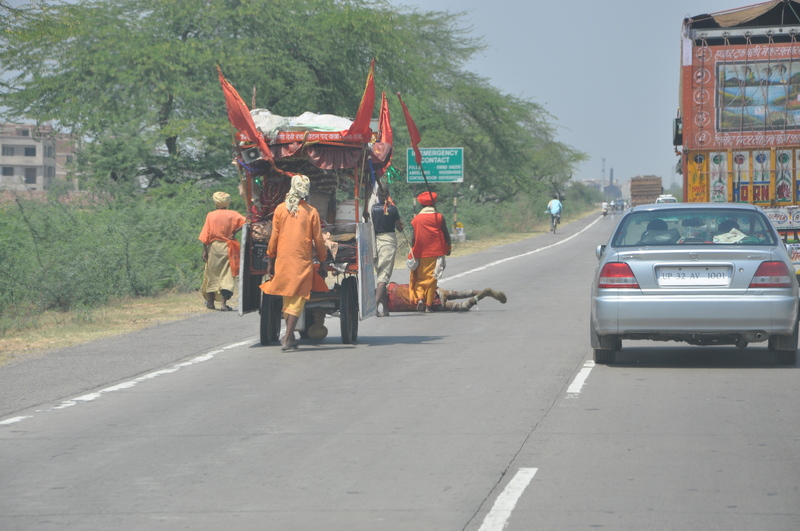 I caught myself repeating “welcome to India” as a mantra for every unexpected scene…and I said it a lot. The unvarnished truth – India is a difficult place to visit and more difficult to navigate, but it’s full of once-in-a-lifetime experiences and rewards patience, tolerance and mild discomfort. Once I linked-up with my driver many problems were solved. Mahendra drove the car, and coordinated with local, English-speaking guides, who met us at local landmarks, and then give me a guided tour for the day. I had mixed experiences with the guides but developed a rule of thumb that seemed to hold up throughout the trip. Guides belonged in one of two groups – either older men who spent their entire lives as guides and made a good living at it, or younger men, college aged, who used it for fast cash from a summer job. The problem with the later group was their propensity to manufacture history on the fly that contradicted the three guide books I reviewed every evening, but it took a bad one to really appreciate how knowledgeable and professional India’s experienced guides are. Over the next week we drove more than a thousand miles during twenty-five hours on the road and visited many incredible places and met unforgettable people.